Intracardiac thrombi are frequent findings that cardiologists encounter in their practice. It is one of the three common differential diagnoses of intracardiac masses besides vegetation and tumors. Intracardiac thrombi are common findings in patients with ischemic stroke (up to 26% of patients with cerebrovascular events).1 It is important to recognize the appearance and features of a thrombus so that anticoagulant therapy can be instituted promptly. Echocardiography plays a major role in detecting intracardiac masses; however, distinguishing the nature of such masses can be difficult. Careful attention to the clinical presentation of the patient as well as knowledge of echocardiographic features of the mass can lead to correct diagnosis and appropriate management. The following six cases illustrate examples of the wide spectrum of clinical scenarios that the patients with cardiac thrombus might present. A 27-year-old Indian man presented with four months history of fatigue and exertional dyspnea. Clinical examination revealed atrial fibrillation with mid-diastolic murmur heard best at the apex. Transthoracic echo revealed severe mitral stenosis and marked dilatation of the left atrium (LA) with "smoke-like" echo in the LA cavity suggesting high possibility of LA thrombus. 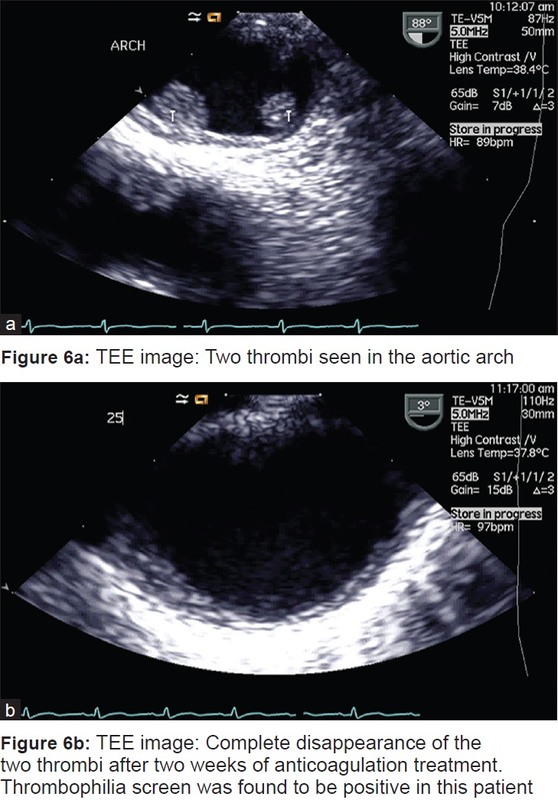 Transesophageal echocardiolgraphy (TEE) [Figure 1]a-c showed a large thrombus in the LA and left appendage. LA thrombi classically reside in the atrial appendage, but can also form in the body of the LA. The presence of an enlarged chamber, atrial fibrillation, a stenotic mitral valve, low cardiac output state, and spontaneous contrast echoes, all favor blood stasis and thrombus formation. 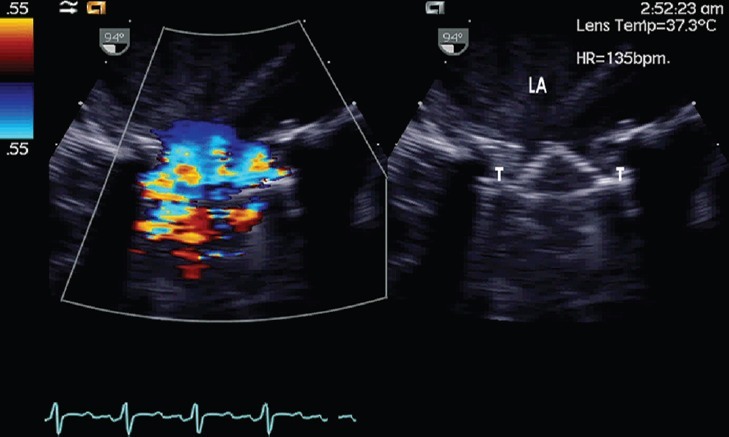 A 54-year-old woman with breast cancer and on chemotherapy through an-indwelling catheter was referred for echocardiography [Figure 2]. In-dwelling catheter thrombus is most commonly attached to the catheter but thrombus could occur away from the catheter, on the wall of the cardiac cavity. Intracavitary right atrial thrombosis is most often considered to result from line-tip thrombosis extension. However, there are other mechanisms of thrombus formation in the setting of an in-dwelling catheter. The to and fro motion of the catheter within the right atrial cavity may produce endocardial injury, and thus predispose to thrombus formation. Another hypothesis is that delivery of chemotherapeutic agent may cause "jet lesion" injury, thus setting the stage for thrombogenesis. (3). A middle-aged man presented with difficulty in breathing, chest pain and tachycardia. Blood investigation was positive for anticardiolipin antibody (ACLA) suggestive of antiphospholipid syndrome. Transthoracic echo as shown in [Figure 3]. Antiphospholipid antibodies such as ACLA that are strongly associated with thrombosis appear to be the most common of the acquired blood protein defect causing thrombosis. The precise mechanisms whereby antiphospholipid antibodies alter hemostasis to induce a hypercoagulable state remain unclear. A 50-year-old man with two weeks history of massive anterolateral myocardial infarction (MI), admitted with ischemic stroke. 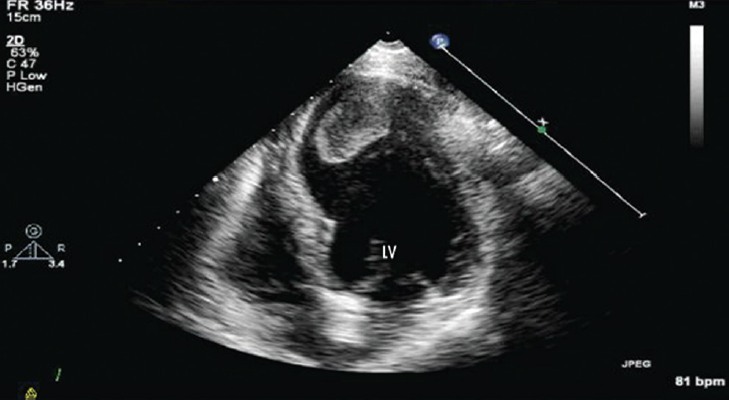 Transthoracic echo revealed big thrombus in the LV [Figure 4]. Ventricular thrombi formation usually occurs in the early phase of anterior myocardial infarction or poorly contracting ventricles. They are most often located in the LV apex in association with anterior and large infarcts, with reported incidence of 10-40%. Several echo features of LV thrombus must be evaluated including the shape (mural or protruding) within the cavity, the the motion, which may be fixed or mobile, and size. A higher risk of embolization is attributable to larger thrombus size and/or thrombi, which are mobile and protrude into LV chamber. After diagnosis, echocardiographic follow-up is needed until thrombus eradication is obtained using anticoagulants. A 22-year-old man with prosthetic mitral valve (MV) replacement secondary to rheumatic heart disease presented with picture of acute heart failure after two weeks from stopping his warfarin treatment [Figure 5]. A 50-year-old man, smoker, was admitted with stroke. MRI showed occluded distal vertebral artery. Transthoracic echo showed no abnormality, however, TEE showed thrombus in the aortic arch [Figure 6]a, which resolved with anticoagulation. A thrombus is identified as a discrete echo-dense mass with well-defined borders that are distinct from the endocardium and seen throughout systole and diastole. The morphology and structure of thrombi have been assessed carefully, since dimensions, shape, regularity or irregularity and homogeneity are all characteristics features that define the embolic risk and therapeutic management. 1. Sen S, Laowatana S, Lima J et al. Risk factors for intracardiac thrombus in patients with ischaemic cerebrovascular events. J. Neurol. Neurosurg. Psychiatry 2004. 75.1421-1425. 2. Stavroulopoulos A, Aresti V, Zounis C. Right atrial thrombi complicating haemodialysis catheters. A meta-analysis of reported cases and a proposal of a management algorithm. Nephrol Dial Transplant 2012;27:2936-44. 3. Fuchs S, Poliak A, Gilon D. Central venous catheter mechanical irritation of the right atrial free wall: A cause for thrombus formation. Cardiology 1999:91:169-72. 4. Pottecher T, Forrier M, Picardat P, Krause D, Bellocq JP, Otteni JC. Thrombogenicity of central venous catheters: Prospective study of polyethylene, silicone, and polyurethane catheters with phlebography or postmortem examination. Eur J Anaesthesiol 1984;1:361-5. 5. Bick RL, Baker WF. Antiphospholipid syndrome and thrombosis. Semin Thromb Hemost 1999;25:333-50. 6. Hagendorf A. Cardiac involvement in systemic disease. The EAE Textbook of Echocardiography, Ed. Leda Galiuto: University Press; 2011. p. 333-4. 7. Andrade MJ. Tumors and masses. The EAE Textbook of Echocardiography, Ed. Leda Galiuto: Oxford University Press; 2011. p. 360-1. 8. Oh JK, Seward JB, Tajik AJ. The Echo Manual. Rochester, MN, 2006: 229. 9. Evangelista A, Gonzales-Alujas T. Disease of the Aorta. EAE Textbook of Echocardiography. Ed. Leda Galiuto: Oxford University Press; 2011. p. 374. 10. Dressler FA, Craig WR, Castello R, Labovitz AJ. Mobile aortic atheroma and systemi emboli: Efficacy of anticoagulation and influence of plaque morphology on recurrent stroke. J Am Coll Cardiol 1998;31:134-8. 11. Pearson AC, Labovitz AJ, Tatineni S, Goomez CR. Superiority of transesophageal echocardiography in detecting cardiac source of embolism in patients with cerebral ischemia of uncertain etiology. J Am Coll Cardiol 1991;17:66-72.